Millennials are the largest generation in the United States. By 2020, one in three adults will be a millennial (born from 1981 to 1997). This generation has already shown itself to be capable of immense innovation and disruption of the status quo. While a significant amount of research has been conducted on millennials, there is little insight on conservation, and even less for the ocean. 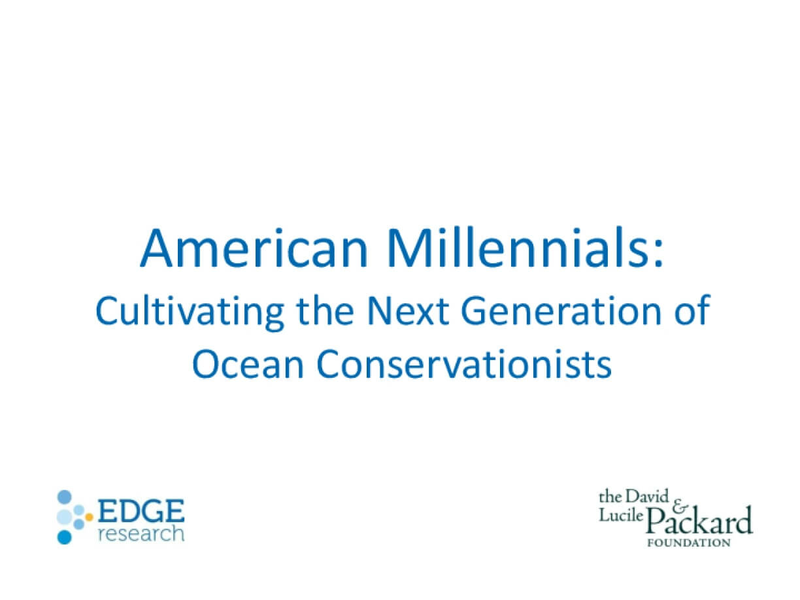 The David and Lucile Packard Foundation partnered with Edge Research to conduct new research on American Millennials' attitudes towards oceans, ocean conservation, and pathways for engaging this next generation of ocean leaders. Edge Research then conducted a set of follow-up research on what current ocean messaging fares well and falls flat with millennials. Below you can access the initial and add-on research to learn more. Copyright 2015 by The David and Lucile Packard Foundation. All rights reserved.